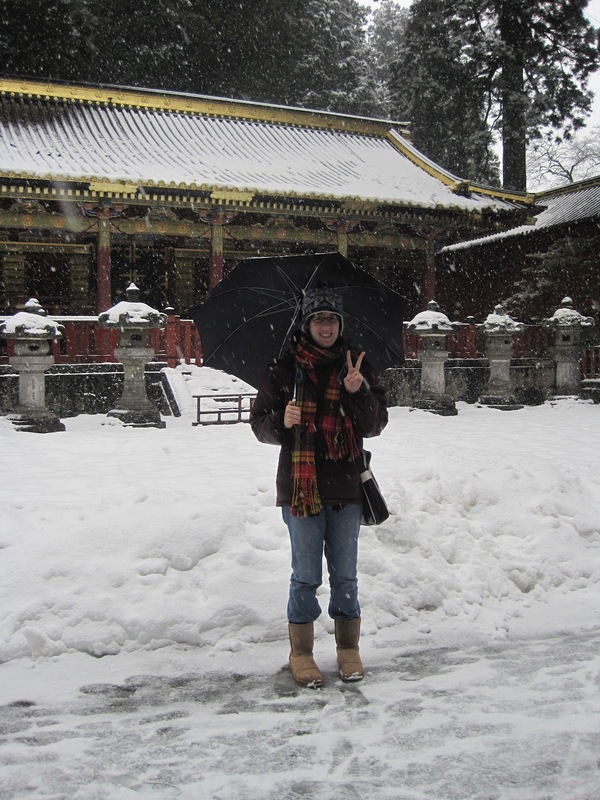 On March 2nd, my host family in Minakami took me on a trip to Nikko, which is town about three hours away known for having a shrine to Tokugawa Ieyasu as well as a big waterfall. When we crossed over from Gunma prefecture into Tochigi, the snow was falling pretty heavily. Our first destination was Kegon no Taki, the aforementioned really big waterfall. We drove up a mountain rode with something like 30 hairpin curves. The mist was pretty thick because of the snow, so when you looked past the side rail on the edge of the road, you couldn't actually see any mountains. I'm amazed my host mom was up to the drive, because my real mom would have flat out refused, but we reached the top and found the parking lot where we would leave the car to head to Kegon no Taki. At this point, both my host sister Yuki and I needed to use the bathroom, so we walked to the nearby information center. Only to be told that there was absolutely no way we'd be able to see the waterfall today. There was just too much snow and mist. So we payed for the use of the parking lot, and turned right back around down 30-odd more hairpin curves. Then lunch, which everyone agreed tasted pretty bad despite being told that the restaurant had a good reputation. And then Yuki and I went back out into the snow to go check out the various shrines and museums to the Tokugawa family. Everything looked really pretty in the snow, but my boots were totally soaked through by the time we got back to the car. They were so soaked that before we went out to dinner on our way home, my host family actually offered to buy me some cheap shoes and socks so I didn't have to go to dinner with wet feet. Of course, they underestimated my shoe size even though I told them what it was, but I appreciated the gesture. A lot. My boots didn't really dry until the next day. But the place we went to was really good. We had this thing called tsubayaki, which was sort of like an upside-down bread bowl. You have a bowl of stew, with a bubble of bread baked on top of it somehow... I didn't think I was going to like it at all but it was delicious. I had a really good cream cheese tart for dessert too. So here's some pictures of all that. 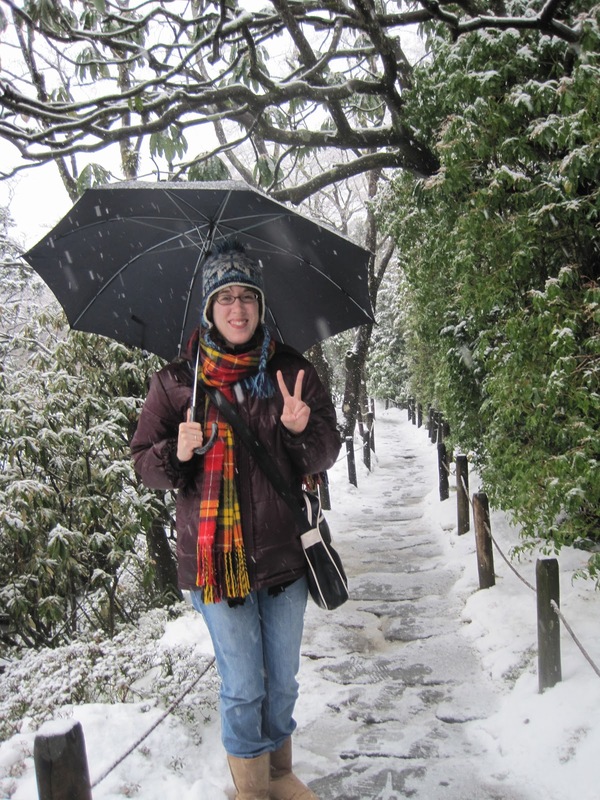 We payed extra to walk around this pretty Japanese garden because I love Japanese gardens, and I'd never seen one in the snow before. This is probably the reason my boots got soaked, but I took a lot of pretty pictures (on Facebook). That's not some kind of noise filter I put on the picture. That's how much snow was falling. Pretty carved temple walls and lots and lots of snow. The only thing worth translating in this entire historical site: "Please refrain from smoking." And the scrumptious tart that finished off the day. I would have liked to have been able to see Kegon no Taki, but I understand it was impossible. I guess I have to figure out some other time to come back there. We ended up kinda hurrying through the temples and museums because of the snow and because everything closes at 3:30, so we ran out of time. But it was still worth it. 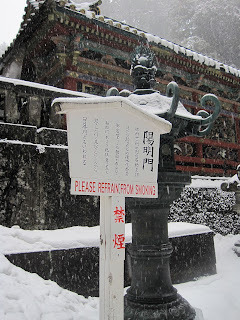 Lots of dramatic pictures of snow-covered Nikko.